I liked Ötzi-man even more since there is good evidence linking him with China, also established by the content of his stomach. When researches tested the contents of his stomach, “they found a bacterium called Helicobacter pylori, an age-old pathogen that has evolved into different strains according to the region of the world in which it is found. About half the people on the planet harbour the bacterium in their stomachs. It can cause ulcers or gastrointestinal distress and is typically spread among children when they play in the dirt. While researchers cannot be sure if the Iceman was sick due to the infection, they were intrigued by their analysis of the geographic history of the bacterium. “Surprisingly, a strain of bacterium in his gut shares ancestry with an Asian strain,” said the study in the US journal Science. “In contrast to the fact that most modern Europeans harbour a strain ancestral to North African strains.”” (The Local/AFP) This was interesting to me since this would be a link relating dry curing with salt and China. Salt-cured Chinese hams have been in production since the Tang Dynasty (618-907AD). First records appeared in the book Supplement to Chinese Materia Medica by Tang Dynasty doctor Chen Zangqi, who claimed ham from Jinhua was the best. Pork legs were commonly salted by soldiers in Jinhua to take on long journeys during wartime, and it was imperial scholar Zong Ze who introduced it to Song Dynasty Emperor Gaozong. Gaozong was so enamored with the ham’s intense flavour and red colour he named it huo tui, or ‘fire leg’. (SBS) An earlier record of ham than Jinhua-ham is Anfu ham from the Qin dynasty (221 to 206 BCE). In the middle ages, Marco Polo is said to have encountered salt curing of hams in China on his presumed 13th-century trip. Impressed with the culture and customs he saw on his travels, he claims that he returned to Venice with Chinese porcelain, paper money, spices, and silks to introduce to his home country. He claims that it was from his time in Jinhua, a city in eastern Zheijiang province, where he found salt-cured ham. Whether one can accept these claims from Marco Polo is, however, a different question. The reach of Chinese technology of salt production was nevertheless impressive. I recently visited New Zealand where I learned that the Māori never developed salt extraction in any form. I did a short review of the colonization of Indonesia and salt extraction technology in an article, “Concerning the lack of salt industry in pre-European New Zealand and other tales from Polynesia and the region” A brief survey of the history of salt extraction from Fiji, Samoa, New Guinea, Vanuatu, and Taiwan shows the large influence of China on regional salt production technology. The study of salt in Polynesia shows that as groups migrated inland, away from the sea, saltwater was boiled to evaporate the water and leave the salt as a very basic salt extraction technique. The salt was then traded with the inland communities. This was widely practiced in Taiwan until fairly recently. The references of it in Polynesia and Asia offers a suggested progression of the extraction of salt from seawater. Studies from Fiji identified population size, even of coastal communities to be a key driver development of salt extraction technology. Inland communities had the added problem by its removal from seawater. It would be my guess that migrants from Taiwan spread their technology throughout the lands of Polynesia. Every evaluation of salt on the islands I looked at supports this. China would undoubtedly have been a key driver in the region in progressing salt extraction technology with Pappa New Guinea playing a large role where a multitude of techniques to extract salt was (and still is) in use. Solar evaporation of seawater, extracting salt through plant material and burning plants, naturally high in salt are a few of the developments from the region, which all presumably have their roots in the practice of simply boiling seawater; in turn, this was probably a progression of the practice of cooking food in seawater; which, in turn had its roots in storing meat in saline solutions; which had its roots in simply immersing carcasses in bodies of water for storage. When we are at this point, we are clearly at the very early age of the existence of cognitive modern humans who were cognitively similar to modern humans. In a discussion with a curator from the Canterbury Museum about the matter of salt production and trade in salt being absent from New Zealand ancient history, he drew my attention to the interesting practice of the Maori to slow boil large quantities of shellfish. Had they not done so, it would not have been possible to consume large quantities at a time. There seems to be evidence that they did, in fact, consume large quantities of this at a time. It supports the notion that they knew about salt and the possibility exists that this was true across the world from very early. People probably knew at least some of the techniques for extracting it, but some local populations, as was the case in New Zealand, may never have used the technology simply because it was not necessary. In the case of the Maori’s, they definitely knew to remove some of the salt from shellfish before consuming it. (They have a word for salt which shows that they definitely knew about its taste). We know that dry-curing of pork takes around 5 to 6 weeks under the right conditions and if the meat is not cut too thick. It must be cool enough that the meat doesn’t spoil before it is cured. Even though I now suspect that curing was first noticed by communities living by the sea as I just explained, I suspect that curing salts in deserts were discovered since natural salts always appear as a mix of various salts and under certain conditions, these salt deposits contain small amounts of nitrate salts and ammonium chloride. Cato may have imitated a process whereby hams are smoked over juniper and beech wood. The process was probably imported by the Roman gourmets from Germania. (economist.com) It is possible that the process of curing itself was brought to Rome by the military stationed in Germany. We are not familiar with this salt in the context of meat curing and more information is in order. I reviewed modern references dating back to the 1700s, 1800s, and 1900s where it continued to be used in meat preservation in Nitrate Salts Epic Journey. Several minerals exist composed of ammonium (NH4). Ammonium is formed by the protonation of ammonia (NH3). Sal ammoniac is the most well known and was named by the ancient Romans. They collected this salt which was found around the temple of Jupiter Ammon in Egypt and called it salt (sal) of Ammon (ammonocius). The name ammonia was subsequently derived from it. It forms in volcanic vents and after volcanic eruptions before it has rained which dissolves it. It is highly soluble. It is unique in that the crystals are formed directly from the gas fumes and bypass the liquid phase, a process known as sublimation. Saltpeter is the curing salt that most of us are familiar with that preceded sodium nitrite as curing agent. By far the largest natural known natural deposits of saltpeter to the Western world of the 1600s were found in India and the East Indian Companies of England and Holland plaid pivotal roles in facilitating its acquisition and transport. The massive nitrate fields of the Atacama desert and those of the Tarim Bason were still largely unknown. In 1300, 1400 and 1500 saltpeter had, however, become the interest of all governments in India and there was a huge development in local saltpeter production. In Europe, references to natron emerged from the middle of the 1500’s and were used by scholars who traveled to the East where they encountered both the substance and the terminology. Natron was originally the word which referred to saltpeter. Later, the word natron was changed and nitron was used. Large saltpeter industries sprang to the South in India and to the South East in western China. In India, a large saltpeter industry developed in the north on the border with Nepal – in the state of Bihar, in particular, around the capital, Patna; in West Bengal and in Uttar Pradesh (Salkind, N. J. (edit), 2006: 519). Here, it was probably the monsoon rains which drench arid ground and as the soil dries during the dry season, capillary action pulls nitrate salts from deep underground to the surface where they are collected and refined. It is speculated that the source of the nitrates may be human and animal urine. Technology to refine saltpeter probably only arrived on Indian soil in the 1300s. Both the technology to process it and a robust trade in sal ammoniac in China, particularly in western China, predates the development of the Indian industry. It is therefore unlikely that India was the birthplace of curing. Saltpeter technology probably came from China, however, India, through the Dutch East Indian Company and later, the English East Indian Company became the major source of saltpeter in the west. To the South East, in China, the largest production base of saltpeter was discovered dating back to a thousand years ago. Here, a network of caves was discovered in 2003 in the Laojun Mountains in Sichuan Province. Meat curing, interestingly enough, is also centered around the west and southern part of China. Probably a similar development to the Indian progression. The Dutch and English arrived in India after 1600 with the first shipment of saltpeter from this region to Europe in 1618. Availability in Europe was, generally speaking, restricted to governments who, in this time, increasingly used it in warfare. (Frey, J. W.; 2009) This correlates well with the proposed time when it became generally available to the European population as the 1700s from Lauder. I believe that a strong case is emerging that the link between Western Europe and the desert regions of Western China was the place where nitrate curing developed into an art. The exact place, I believe, in Western China is the Tarim depression. He wrote an important article in 1921, Substitutes for Sucrose in Cured Meats. Writing at this time, this formidable meat scientist is ideally placed to comment on the use of sugar in meat curing in the 1800s since the basis of its use would have been rooted in history. From the process description, it is clear that we have finally identified the Morgan, father of the arterial injection method in meat curing as Dr. John, professor of anatomy at the University of Dublin, son of Dr. John Morgan, Surgeon to Guy’s Hospital. The original inventor of the system was the Dutch physician, Frederik Ruysch and the application was embalming. This re-using of the brine would turn out to become the cornerstone of the industrial revolution for bacon curing and the country credited for this development is Ireland. Before we get to that, we have to first look at barrel pork. In the 1800s, this was the main way that the packing plants in the USA exported pork to England as bacon. There are many accounts in newspapers of the time where advice is given to the bacon producers on how to make sure that the meat arrives in England unspoiled. One of the main points was the importance of using good, new wood for the barrels. It is this old brine or re-used brine that became the cornerstone of the industrial bacon curing plants in Denmark and which they call the “mother brine”. Needle injection of meat along with the faster curing action of the mother brine would become the key feature of curing plants in Denmark and would later be adopted by factories around the world. It was the fastest way of producing bacon and was remarkably effective. The invention of what became known as tank curing or mild cure was, however, not Danish, but Irish! When I started looking into the different aspects of curing that is united in Oake’s invention, I wondered what exactly did Oake invent? It is possible that the entire process of handling the animal from killing to actual bacon is his claim to fame and not any one particular part of the invention. As is so often with great inventors, they often take information which is out there and combines it in new and useful ways. This may be the exact legacy of Oake. He thought through the entire process, packaged it, named it and then advocated it. To the Irish belongs the credit for this! Let us return to the 1930 reference in the Complete Grazier which we looked at above. They wrote that the brine mix must be boiled over a gentle fire for the impurities to rise to the top before these were skimmed off and the brine allowed to cool down. They reported that such brine is re-used “with advantage”. Before it is re-used, the old brine must be boiled first and water and the other ingredients must be added proportionately. This may actually be a report on the process invented by Oake which may take the invention by Oake back to 1830. Lets also again look at the description of barrel pork from 1776. “After the meat has cooled,” probably after the hair was removed, “it is cut into 5 lb. pieces which are then rubbed well with fine salt. The pieces are then placed between boards a weight brought to bear upon the upper board so as to squeeze out the blood. Afterward, the pieces are shaken to remove the surplus salt, [and] packed rather tightly in a barrel, which when full is closed. A hole is then drilled into the upper end and brine allowed to fill the barrel at the top, the brine being made of 4 lb. of salt (1.8kg or 10%), 2 lb. of brown sugar (0.9kg or 5%), and 4 gallons of water (15L or 84%) with a touch of salt-petre. When no more brine can enter, the hole is closed. The method of preserving meat not only assures that it keeps longer but also gives it a rather good taste. The next element Oake improved on was the actual place where the curing is done. Instead of wood, Oake designed special curing tanks and moving away from barrels with its obvious drawback of using wood to cure bacon in and the accompanying problem of insects that inhabit the wood. The next major improvement was in the design of the actual brine. The most interesting aspect of his cure is his use of sal prunella. He used a very pure form of saltpeter. Not the kind that is used as fertilizer, but the kind that is used to make black powder. The Irish were, at the time of Oake’s invention, actively experimenting with preservatives in their medical universities. I believe the invention was in part done, because of knowledge they developed on how to preserve human bodies for the purpose of gaining medical knowledge or training physicians. Oake was probably trained by men, proficient in the morbid arts. Apart from the use of sal prunella, Oak used a position proposed by none other than Liebig that the preserving power of salt was not due to the chemistry of salt or some secret power contained in it but due to the fact that it drew out the moisture from meat. Oake explains that it was believed that salt drew out the albumen from the meat and it is when water comes into contact with the albumen that putrefaction sets in. The essence of the invention, according to him, is that the meat is cured while the albumen remains in the meat and does not taste as salty as dry cured bacon. Oake’s invention rests, then, on the stepwise process, the use of specially designed tanks and his scientific description of the preservation process which was made possible by his training as a chemist. This gave his system instant credibility because he was able to describe it in the scientific language of our time. In Ireland, just sometime, probably between 1830 and 1837, a wet curing method was invented by William Oake. (Tank Curing was invented in Ireland) A major revolution took place in Denmark in 1887/ 1888 when their sale of live pigs to Germany and England were halted due to the outbreak of swine flu in Denmark. The Danes set out to accomplish one of the miracle turnarounds of history by converting their pork industry from the export of live animals to the production of bacon (there was no such restriction on the sale of bacon). This turnaround took place in 1887 and 1888. They used the cooperative model that worked so well for them in their abattoirs namely the cooperative. They were amazingly successful. In 1887 the Danish bacon industry accounted for 230 000 live pigs and in 1895, converted from bacon production, 1 250 000 pigs. This is astounding. It means that they had the technology and when the impetus was there, they converted their economy. It also means that Ireland not only exported the mild cure or tank curing technology to Denmark but also to Australia, probably through Irish immigrants during the 1850s and 1860s gold rush, between 20 and 30 years before it came to Denmark. Many of these immigrants came from Limerick in Ireland where William Oake had a very successful bacon curing business. Many came from Waterford. A report from Australia sites one company who used the same brine for 16 years by 1897/ 1898 which takes tank curing in Australia to well before 1880 which correlates with the theory that immigrants brought the technology to Australia in the 1850s or 1860s. One further note about the invention of tank curing by Oake from Ireland. He apparently was a chemist and his invention had as much to do with the brine makeup as it had to do with the fact that tanks were used and the brine re-used. Morgans work shows clearly that curing brine was a priority in Ireland in the mid-1800s. The possibility that Oake and Morgan interacted and possibly influenced each other is a tantalizing likelihood that emerges from the data. It was Denmark, however, who continued to expand on the tank curing system or mild cured system, as it was called, using a combination of stitch pumping and curing the meat in curing tanks with a cover brine. (Wilson, W, 2005: 219) Brine consisting of nitrate, salt and sugar were injected into the meat with a single needle attached to a hand pump (stitch pumping). 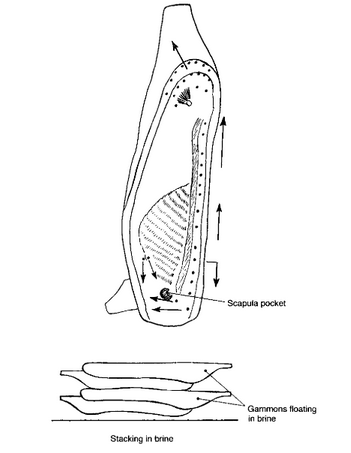 Stitch pumping was either developed by Prof. Morgan, whom we looked at earlier or was a progression from his arterial injection method. The question comes up if we have corroborating evidence that Denmark imported the Irish technology in 1880? Clues to the date of the Danish adaption come to us from newspaper reports about the only independent farmer-owned Pig Factory in Britain of that time, the St. Edmunds Bacon Factory Ltd. in Elmswell. The factory was set up in 1911. According to an article from the East Anglia Life, April 1964, they learned and practiced what at first was known as the Danish method of curing bacon and later became known as tank-curing or Wiltshire cure. The East Anglia Life report from April 1964, talked about a “new Danish” method. The “new” aspect in 1910 and 1911 was undoubtedly the tank curing method. Another account from England puts the Danish invention of tank curing early in the 1900s. C. & T. Harris from Wiltshire, UK, switched from dry curing to the Danish method during this time. In a private communication between myself and the curator of the Calne Heritage Centre, Susan Boddington, about John Bromham who started working in the Harris factory in 1920 and became assistant to the chief engineer, she writes: “John Bromham wrote his account around 1986, but as he started in the factory in 1920 his memory went back to a time not long after Harris had switched over to this wet cure.” So, late in the 1800s or early in the 1900’s the Danes imported the Irish system and practiced tank-curing which was brought to England around 1911. The 1880 date fits this picture well. It only stands to reason that the power of “old brine” must have been known from early after wet curing and needle injection of brine into meat was invented around the 1850s by Morgan. 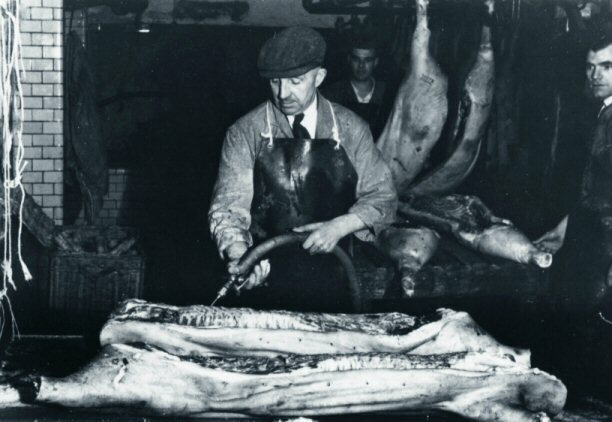 Before the bacterial mechanism behind the reduction was understood, butchers must have noted that the meat juices coming out of the meat during dry curing had special “curing power”. It was, however, the Irish who took this practical knowledge, undoubtedly combined it with the scientific knowledge of the time and created the commercial process of tank-curing which later became known as Wiltshire cure.